Feels a bit scandalous passing this off as an actual recipe, but I wanted to share this. I bought a Nutribullet about a month ago in a bid to get more greens into our diet. Let’s just say, we aren’t naturally skilled at making tasty green juices and I have said ‘just hold your nose and down it!’ more than I would have liked. 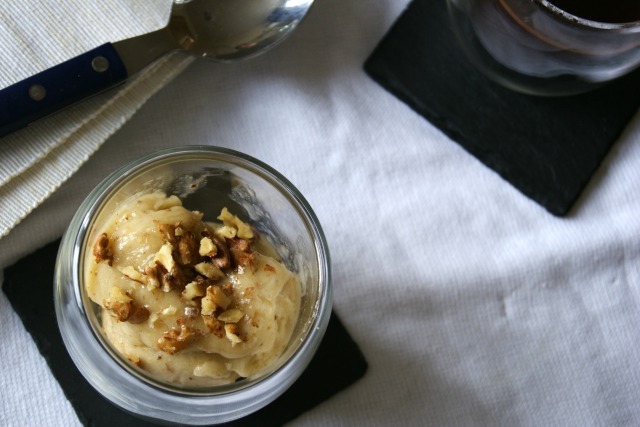 One thing we have nailed is banana ice cream. Here’s how you prepare it, now make sure you concentrate, it’s a tricky one. Easy! I gave this to my boyfriend who genuinely didn’t believe that it didn’t have anything else in, but the creaminess you get from the blended banana is all you need. Allow it a few minutes to melt slightly, then swish it around again and it gets even better. I have been eating this on it’s own or with some chopped nuts, but I think it would be great with some caramel sauce. Bit less healthy, but all that fruit must cancel it out right? !